SSCC Theatre Company proudly presents A Winter Evening with Frost & Friends, playing in The Edward K. Daniels Auditorium at Southern State Community College, Hillsboro, Ohio, Saturday, February 2 at 7:30 p.m. The cast for the evening includes: Laura Bauer, Bob Brown, Paula Campagna, Faith Fetters, Madison Hatfield, Ian Holmes, Leslie Holmes, Mark Holmes, Emma Horick , Jenna Horick, Bronwyn Jones, Jackson King and Matthew Waits. Production crew includes, Rainee Angles, Sarah Jo Beyersdoerfer, Charlotte Brown, DJ Griffith, Melissa Griffith, and Shane Taylor. Tickets for A Winter Evening with Frost & Friends are on sale now for only $5 at www.sscctheatre.com. Credit cards are accepted for online purchases and at the door. Seats for this production will be reserved, so it’s recommended that tickets be purchased early. Due to unforeseen circumstances, the originally scheduled SSCC Theatre Company production of RFK has been cancelled for the season. All season ticket holders, and those with RFK tickets, will be substituted tickets for A Winter Evening with Frost & Friends. We apologize for any inconvenience. 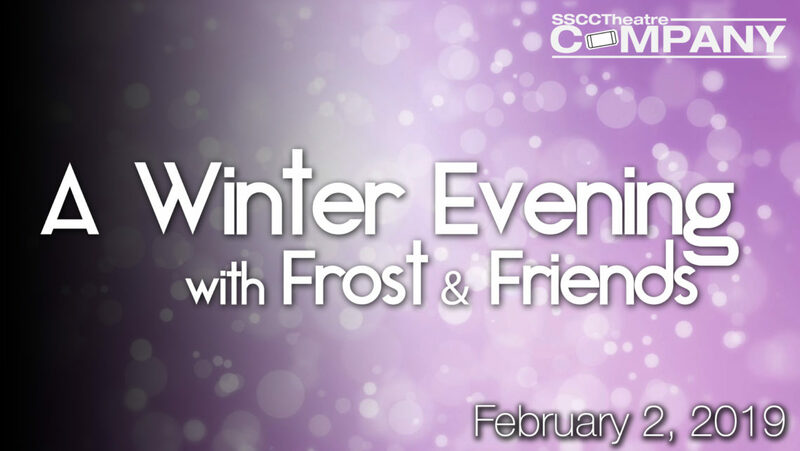 For more information about A Winter Evening with Frost & Friends, SSCC Theatre Company, and season tickets, please visit www.sscctheatre.com.